BJ graduated from Tufts Veterinary School in 1993 and established Townsend Veterinary Hospital in the Old Brick Store in West Townsend in 1995. The new facility was completed in 2005, and the practice relocated one mile down Main Street to its current address in Townsend. BJ loves difficult diagnostic challenges and has a dedication to pursuing all possible options to help a patient. He has pursued additional training in ultrasound imaging. The most important thing to BJ is his family. He is an extremely dedicated father and husband to his wife, Margo and his four children, Aubrey, Noah, Bennett, and Luca. BJ lives in Ashby and spends his free time attending to his kids’ activities which include Little League, ice hockey, theater, and piano. He is an avid Red Sox fan and attends as many games as possible. Dr. Easley joined Townsend Veterinary Hospital in 2005. He graduated from Washington State Veterinary School in 1967 and completed his surgical residency and training at Angell Memorial Medical Center in 1975. He is a board-certified veterinary surgeon. He lives in Lancaster with his wife, Sandra and his adorable Yorkshire Terrier, Bella. They have a daughter and two grandchildren. Dr. Easley enjoys spending time with his grandchildren, fishing, bowling, and riding his motorcycle. Diane just celebrated her 18th year as practice manager for Townsend Veterinary Hospital. Her affection for the staff, clients, and patients of Townsend is clearly evident by her intense devotion to their well-being. Diane is a long-term resident of Townsend and knows many of our clients personally. She lives with her husband, Norm, and her treasured cats, Ozzy, Sophia, Kahuna,and Bamboo. She is proud of her three grown children and ten grandchildren. Diane enjoys spending time with her grandchildren and staying active by working out regularly at the health club. She and Norm escape the winter weather to their home in Florida for several weeks each winter. Deb graduated from college in 1989 with an associates degree in AnimalHealth Technology. She worked for Malden Animal Hospital for 8 years as the head technician as well as 2 years at Arlington Animal Hospital. We’ve been fortunate to have Deb working with us at Townsend sinceJuly of 1999. Deb loves all animals including horses and cows, but adores Great Danes and all BIG dogs. She also loves the little ones --especially pomeranians. 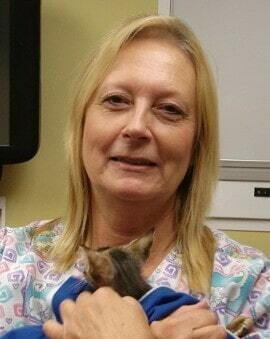 Laurie joined Townsend Veterinary Hospital in 2005. She has been Dr. Easley’s chief technician for over 20 years. Anyone who is referred to Townsend for Dr. Easley's surgical services will be comforted by Laurie's dedication to their welfare. Laurie lives with her much loved family of papillions, cats, and chickens. Leanne has worked for Townsend Veterinary Hospital for over 18 years. She is a graduate of the veterinary technician program at Becker College. Clients are comforted by her cheerful enthusiasm for her job and her compassionate care of their pets. She has 3 dogs, 3 cats, a leopard gecko, 2 guinea pigs, lots of fish, and lots and lots of chickens. Nicole joined us in the summer of 2017 and has quickly become a valued member of our team. Jackie has been with Townsend since 2005. Her enthusiasm for her job and desire to help our patients is obvious to anyone who meets her. She lives with husband, Kevin, dogs, Yogi and Billie Jean, and cats, Will, Grace, Meadow, Cricket, Frankie, and Buggs. She enjoys gardening, pet sitting, and anything involving animals. 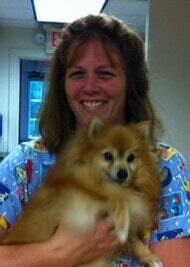 Shannon has been working as a receptionist for Townsend Veterinary Hospital since January 2009. Clients appreciate her enthusiasm for helping them solve problems. She received additional training in nutritional management for medical problems making her a wonderful resource for trying to make sense of the different foods available for a pet's condition. Outside of work, Shannon enjoys spending time with her children and grandchildren and shares her home with her dog Lily, 4 cats - KitKat, Bagheera, Oreo, Moe and Buttercup a 17 year old cockatiel . Kristi joined our TVH team in 2010 and is proud to be part of a team that shows such compassion for pets and their owners. Kristi enjoys spending time with family. She has a natural artistic ability with decorating and planning events. She is the proud parent of a yellow lab named Brooke as well as two grown sons, Hunter and Nick. Kristi has become such a great asset to the Townsend Veterinary family with her spunky personality and her ability to create a welcoming reception area for our clients to enjoy. Alexa adds her 10 yrs of experience as a veterinary receptionist to our team. She has three grown daughters and recently relocated to New Hampshire with her husband. She breeds and shows French Mastiffs in her free time. Jess has always had a love for animals and pursued this passion with a degree in animal care from Becker College. She started working for Townsend Veterinary Hospital in 2007. She enjoys taking care of all the needs of the patients and staff at Townsend. Jess is married with one son, currently in college. She enjoys playing with her beautiful, mischievous felines, Crush and Pippen. Donna has worked for Townsend Veterinary Hospital since 2005. Donna dotes on her cats--too numerous to name here but not too numerous for each one to feel loved and special in their own way. The love and patience she shows every day with her house full of special needs cats is incredible.